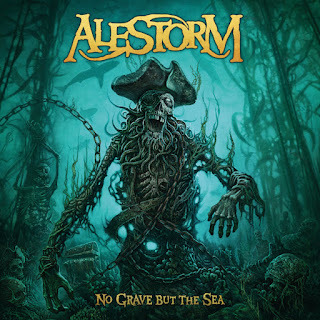 Hall of the Mountain King: Review: Alestorm, "No Grave but the Sea"
I only wish that Alestorm could have released this song four or five years ago. Had I heard it when I was still in the newspaper business, I might have wept at the beauty of the chorus lyrics. Even today, I can still appreciate it, though. I daresay that this will end up as my favorite song of the year. Moving on, let’s go to a song that’s epic in the truer sense of the word, the title track “No Grave But the Sea.” My second favorite track, it opens the album in grand style, a galloping, driving heavy tune with an appropriately nautical- themed keyboard melody overlaying the heavy guitars on the opening and chorus. As always with Alestorm, there’s a fantastic hook that’s nearly impossible to get out of your head – at least until the next song kicks in. That’s where the first bit of silliness on No Grave But the Sea shows up. “Mexico” opens with an 8-bit video game intro before Christopher Bowes shares all of his favorite things about the aforementioned country, and they’re pretty much the things you’d expect – tequila, margaritas, tacos and, yes, a donkey show. The hook on this one may be second only to “Fucked with an Anchor” in its ability to rattle around in your head for days. The big expected sing-along drinking song comes on “Bar und Imbiss,” Alestorm’s tribute to a German spot where you can get sausages and local beer. There’s a surprisingly somber moment on “Man the Pumps,” which has another one of those melodies straight from a pirate movie soundtrack. The song tells the tale of a sailor whose job is to pump the bilge water on a leaky boat. On a stormy night, he finds himself alone at the pumps and saves the boat at the cost of his life. This track isn’t as depressing as it might sound, but it’s certainly not as silly as much of the other material. Still a great song, though. There are a number of those made-for-a-pirate-movie soundtrack moments scattered throughout No Grave But the Sea, notably “To the End of the World” and album closer “Treasure Island,” the longest song on the record at just over eight minutes. The chorus of the latter would almost fit in a Broadway show, maybe a heavier version of “Pirates of Penzance.” That’s balanced out, though, by a heavier guitar tone once the bombastic pieces of the song are over. I maintain that Christopher Bowes is a musical genius, and I can always count on him to put a big, goofy grin on my face whether it’s the pirate metal of Alestorm or the heroic fantasy power metal of Gloryhammer. This album is no different. You’d think he’d run out of ways to sing about drinking, sailing and plundering at some point, but five albums in, that’s clearly not the case. In a musical year that’s been pretty barren, No Grave But the Sea washes ashore as a very welcome arrival. Quite a while since I last heard from you and It is good that you are back with another review. Have heard a lot about it but haven't listened to it yet.